2018 has been an insect year. As we start to approach the end of summer, there are still a few pests to be concerned about before the crops are ready for harvest. Western bean cutworm (WBC): Overall, the WBC population have been lower than previous years. With the majority of the corn crop beyond the fresh silk stage in the most southern five counties, corn trap catches have dropped considerably in that area. Peak flight has occurred one to two weeks ago in that region. Traps in Oxford to Bruce and Grey, across to Brant are still seeing some decent catches and will likely peak this week. 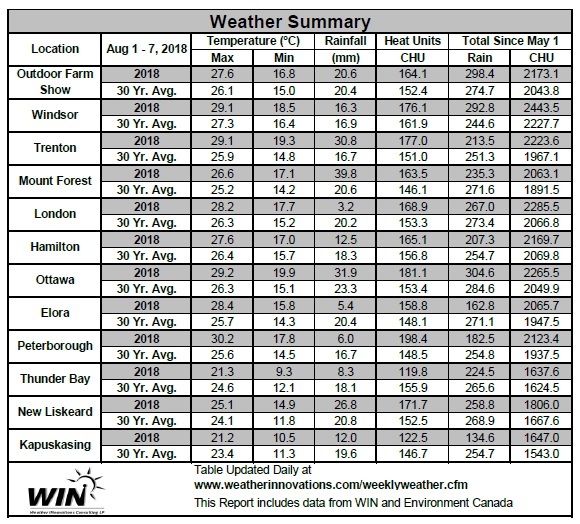 Compared to previous years, Haldimand and Norfolk have experienced very low populations, as has the hot spot area around Bothwell. Fields in central and eastern Ontario may still see some egg laying in later planted corn that is still in the tassel to fresh silk stages over the next two weeks. Early corn planting and scouting is really paying off this year in corn, as many fields have had few egg masses in them and many beneficial insects have been waiting to help reduce the WBC population as they arrive. At the same time, trap captures from dry bean fields have increased significantly in the last two weeks. In fact, the average trap catch in dry beans has exceeded that of previous years. This is due to the moths being more attracted to dry bean fields when corn is beyond their favoured stages. Dry bean fields that are in the flowering to pod stages are most at risk now. Especially those counties that have not reached peak flight yet including Oxford, Perth, Huron, Bruce, Wellington, Waterloo, Brant, Simcoe and Grey. As scouting for WBC in dry beans is difficult and ineffective, spray is warranted if dry bean traps have accumulated at least 150 moths per trap. Timing of application should occur after peak flight has occurred in your area, and only once pods are developing on the plants. More information on moth flights can be found at https://www.cornpest.ca/wbc-trap-network/ and by following @TraceyBaute on Twitter. Bean leaf beetle (BLB): There was a surprising number of overwintering BLB adults this spring, which mate and lead to the first generation adults that enter pod stages of beans this time of year. This pest is only a concern for IP, food grade and seed soybeans as well as dry beans. Leaf feeding is not really the issue at this point; it is the pod feeding that can introduce pod diseases and impact seed quality (Figure 1). For IP, Food Grade or Seed Soybeans, if 10% of the pods on the plants have feed scars on them during the R4 to early R6 stages, a spray is warranted. For Dry Beans, with higher value and stringent quality standards, if 5%–8% of the pods inspected have feeding scars, control may be necessary. If pods are being clipped and found on the ground throughout the field in either crop, an application is also warranted. Ensure that adults are still presently active in the field before spraying and consider days to harvest intervals when selecting which products to use. Stink bugs and tarnished plant bugs: The easiest to spot “bugs” found right now have been stink bugs (Figure 2) and tarnished plant bugs. 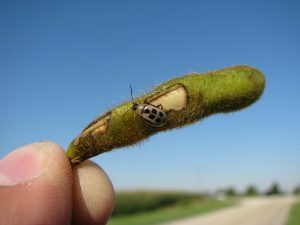 Both adults and nymphs feed directly on pods and seeds of soybeans and dry beans, using their piercing and sucking mouthparts. As they pierce the pods, they inject digestive enzymes into the seeds, causing the seed to dimple or shrivel, resulting in picks. The feeding wound provides an avenue for diseases to gain entry into the pod and seed quality is reduced. Indirect effects of stink bug feeding can include delayed maturity — green bean syndrome —of injured plants, though stink bugs are not the only cause for green bean syndrome. For these two pests, a sweep net is the best tool to assess populations as they are fast moving. Take 20 sweep samples (in a 180° arc sweep) in five areas of the field and determine the average number of adults and nymphs per sweep by dividing the total count by 100. In IP, Food Grade or Seed Soybeans and Dry Beans, control is warranted if an average of 0.2 stink bugs per sweep is found (or 20 bugs in 100 sweeps) in R4 to early R6 stage beans. Even in crush beans, control may be warranted if an average of 0.4 stink bug adults or nymphs per sweep is found during these stages. 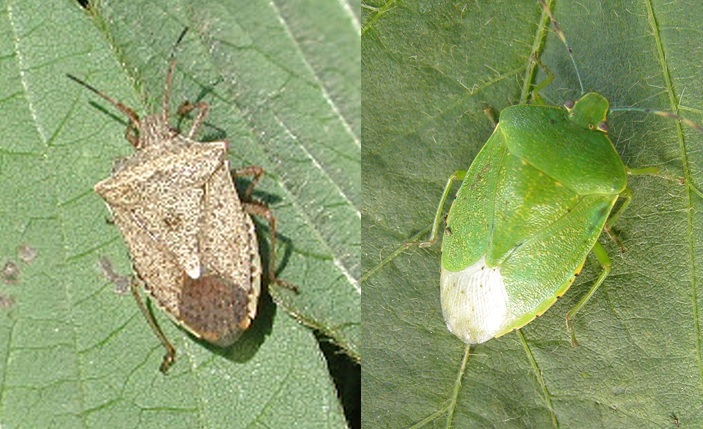 Tarnished plant bugs tend to prefer dry beans and warrant control if an average of one to two tarnished plant bugs (nymphs or adults) per sweep is found during the pod stages.